Pneumonia is an infection of the deepest part of the lungs where the cells exchange oxygen and waste material from the blood. The pathogen causing pneumonia – can be either a virus, bacteria or fungus. The pathogen – invades the lungs, causing inflammation that leads to cell death. As the body fights off the infection it can also lead to destruction of the lung tissue. The pathogens that cause pneumonia also affect other organs. This – and the activation of the immune system – is what causes the general-body symptoms such as fever, chills, fatigue, and diarrhea. Viral infections can also weaken the lungs making them more susceptible to bacterial infections. This is why the flu – which is a virus – can cause secondary bacterial pneumonia. Pneumonia is often classified by how or where it was caught (acquired): in the community, for example, school or home; aspirated, such as from inhaling stomach acid; or while staying in a hospital. Pneumonia is further classified by which part of the lungs are affected and by the causative pathogen. This article is about community-acquired pneumonia that can be safely treated at home. The respiratory system is divided into two parts: the upper respiratory tract that starts at the nose and ends approximately at the adams apple; and the lower respiratory tract that starts at the adams apple and goes all the way to the tiniest tubes of the lungs called the alveoli. Viral causes of pneumonia usually enter the body when a person touches their mouth, nose, or eyes after touching a contaminated surface. The virus can also enter the body by inhaling airborn droplets contaminated with viruses. Pneumonia usually starts as an upper respiratory tract infection that makes its way down to the alveoli. It is at the alveoli that pneumonia manifests and causes its destructive tendencies. Common signs and symptoms of pneumonia are productive cough, shortness of breath, fast breathing, chest pain that can be sharp especially with deep breathing, chills, and fever. In the elderly confusion may be the only symptom and in small children the only symptom may be fever and cough. Some types of pneumonias, especially the “atypical” pneumonias, may have no lung symptoms at all. For example legionella pneumonia has abdominal pain, diarrhea and confusion as the main symptoms. Many other lung conditions can present with similar signs and symptoms of pneumonia, such as: chronic obstructive pulmonary disease (COPD), asthma, pulmonary edema, and blood clots in the lungs. 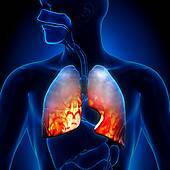 Careful physical exam and testing can rule out these other causes of lung ailments. The diagnosis of community acquired pneumonia is based on signs and symptoms, physical exam and x-ray. The causative organism is difficult to diagnose and is usually not necessary to identify in order to successfully treat community-acquired pneumonia. In the outpatient setting blood tests have limited usage, but x-rays are important to confirm the diagnosis of pneumonia. It is common that patients who present early with pneumonia may have negative findings on chest x-rays. The bacteria, white blood cells and fluids from the inflammation is what is seen on x-rays. This is what is called consolidation and is seen as white patches in the lungs. Most people who have community-acquired pneumonia are treated at home with antibiotics. If the cause is viral, antibiotics won’t work. In that case antiviral medication may be used. Viral pneumonia resolves by itself in 1 to 3 weeks. If a person does not respond to treatment they will need to be admitted to the hospital for stronger intravenous antibiotics and further testing. Pneumococcal Pneumonia Vaccine prevents pneumococcal pneumonia and is good for 5 years. The general CDC recommendations for getting this vaccine are: people who are 65 years old or older; people who have chronic diseases, or weak immune systems; people who smoke; children who are younger than 5 years old. The flu vaccine is important because many people get pneumonia after having the flu. In children who are under 5 years old Haemophilus influenzae type b (Hib) vaccine is important because Hib is a cause of pneumonia in children under 5 years of age.